The Whitaker Rectangular Cocktail Ottoman by England at EFO Furniture Outlet in the Dunmore, Scranton, Wilkes-Barre, NEPA, Bloomsburg, Pennsylvania area. Product availability may vary. Contact us for the most current availability on this product. Optional nailhead trim and optional casters available. 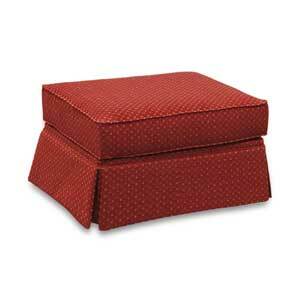 Customize this ottoman in your choice of fabric or leather by special order for a distinctive home accent. The Whitaker collection is a great option if you are looking for furniture in the Dunmore, Scranton, Wilkes-Barre, NEPA, Bloomsburg, Pennsylvania area.